One down and one to go. 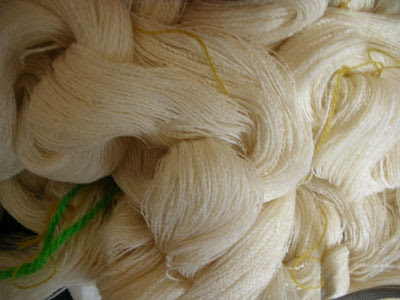 Warp and weft are 100% wool. 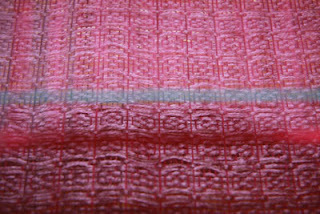 Top image has 2 lines across it these are sample colours for the next scarf. 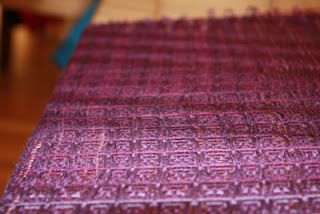 One is more pink and the other green, I am undecided what to use at this stage but need to get to and weave this week. 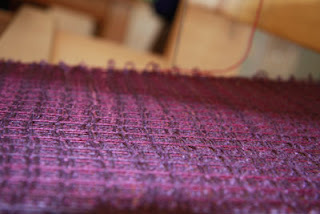 OK the purple warp is on the loom and set at 12 threads per inch and the total width is 14.5inches. So now to start experimenting I think colour is my main problem although the brain is mush and not so sure what structures I should use. Having a limited range of colours and fibres. Maybe as Mel suggested over dying may be the way to go. Now I need time to play. Any suggestions? The above warps were wound from left over bobbins of wool from previous projects. I don't particularly like either of the purple or red/brown warps but thought I should use up some of the wasted thread. Now the question what should I be weaving? They have been wound as scarf widths and there is no matching thread from the weft, so Melly thinking cap on and give me a challenge. 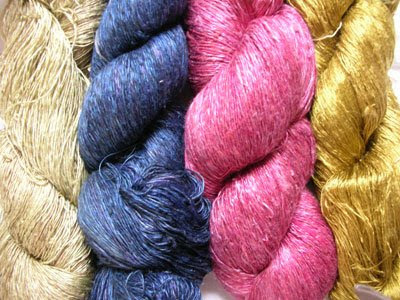 My silk purchase, now what should I make? Selling yarns 2 conference was held at the National Museum in Canberra 6-9 March 2009. 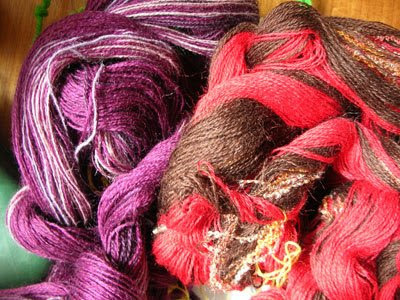 Market day was held on Sunday and there were amazing demonstrations and Indigenous fibre products for sale. 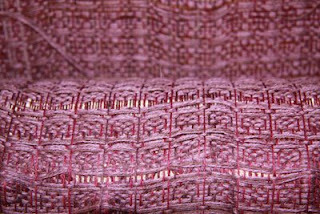 Lao Silk was also for sale and as a weaver how could I resist.